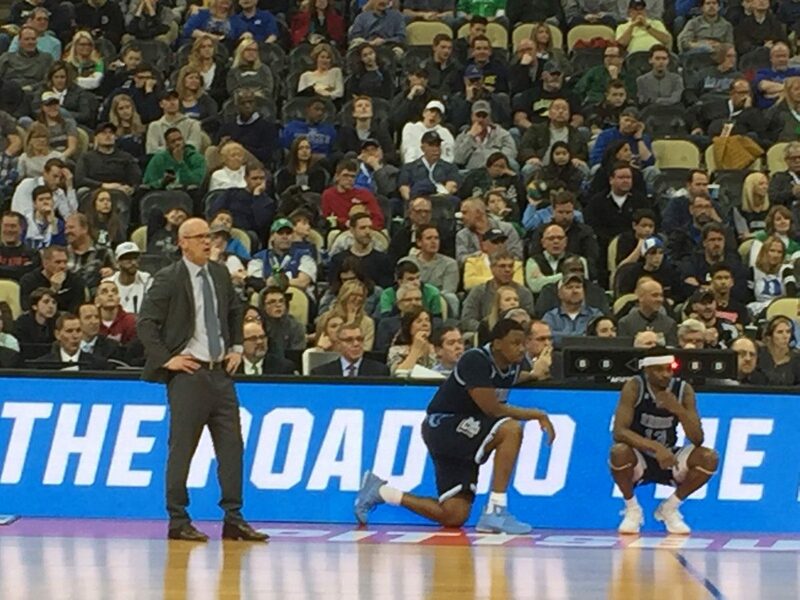 PITTSBURGH — In the wake of an emotional NCAA Tournament loss to Duke, Rhode Island coach Dan Hurley said he “could give two craps” about potential job openings to which he’s been linked. Hurley has been linked to the openings at UConn and Pittsburgh, both of which presumably would offer him more money than he currently makes. Hurley and his family plan to decompress and possibly go on vacation for the time being. His older brother, Arizona State coach Bobby Hurley, is already in Cabo San Lucas, Dan said. Hurley, 45, is 112-82 (.581) in six seasons at the A-10 school. This year’s team won the Atlantic 10 Conference regular season title and finished 26-8. In May he agreed to a one-year extension through 2023-24. His base salary is $300,000, and his annual compensation by the end of the deal will be nearly $1.1 million, per the Providence Journal. Rhode Island redshirt senior guard E.C. Matthews and the other seniors appeared on the dais with Hurley.